Yes, good criticism, Steve. I’ve definitely stopped short of saying everything that could be said about this. I do tend to think that atheism-agnosticism is a form of denialism. 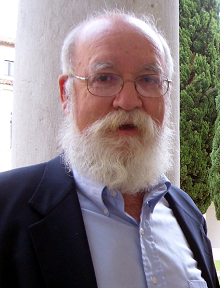 In light of the very useful insight Dennett gives about rhetorical questions, what would you say he reveals in his rhetorical question about God? Denialism is denying facts. Atheists don’t deny facts. Or at least, intellectually rigorous atheists don’t deny facts. I guess that he’s postulating that the universe has a more mundane explanation than a requirement that a super-intelligent eternal being created it for his own purpose. He’s postulating that it’s “just” a “natural” object, and that one day the laws of physics might be able to explain it, just like physics can already explain a great deal about the universe. He’s saying that the idea of God is supernatural, which implies that we will never be able to explain it, because God “did” it. By analogy, if a court of law finds a person guilty of a crime, that could be because that person broke the law (in which case, we could explain why the court found the person guilty) or it could be the kind of court (in a dictatorship) where the court has powers to find people guilty if it chooses to. That kind of decision could never be explained. It just is. So Dennett is proposing that there are two ways of thinking about the world. The first is that the universe is a rational thing governed by predictable laws (if you know the laws). The second is that it cannot be understood, because it doesn’t follow laws, just the whims of its creator. Yes, I think that could be what he means by that rhetorical question. I agree also that there are much more serious fallacies. In fact, I wouldn’t really include the rhetorical question in itself in a list of fallacies — maybe certain misuses of rhetorical questions. What I was really intrigued by was Dennett’s idea that a rhetorical question often reveals the limits of the author’s thinking, his uncertainty, or the weakness in his argument. So when he in the next section raised a rhetorical question, that got me asking, what weakness does his question reveal about his argument? I agree. It is possible that a rhetorical question reveals some limitations to a person’s thinking, but they are very useful tools in debate. Don’t you agree? LOL. Heh — yes, very useful, and for teaching and writing as well. I haven’t read this book yet, or anything that Dennet wrote, so what did he write after this rhetorical question? Did he go on to expand his point, or did he just leave it to the rhetorical question to make his point? It seems to me that you are taking these two point out of context. We should be watchful of people who make arguments out of rhetorical questions, but if they expand the argument to articulate their point, then nothing is amiss. And considering the context of the Occam’s Razor, one could argue that a rhetorical question is perfectly acceptable as a lead-in to an argument. My second point of contention is the assumption that this was a rhetorical question in the first place. Again, considering the context of the topic it is perfectly acceptable to ask this kind of a question in a non-rhetorical sense; an actual answer is fully expected. Also, your partial answers to different parts of the question are not very well thought out. Dennet does not claim that “a supernatural being is incomprehensible.” What he does is to attribute the characteristics of both “supernatural” and “incomprehensible” to God. But even if he did say what you claim, something supernatural is incomprehensible by definition. All that we have access to, and can ever have access to, is the natural world. If something is supernatural, then it lies outside of the realm that we can have access to. And if you think that we do have access to the supernatural, I would ask you to provide some evidence for this. Scientific evidence would be awesome, but even logical evidence would suffice. If you can somehow reconcile the problem of the interaction between two completely different substances (sharing nothing in common), then you might have something to stand on. Your second answer is equally as baffling to me. What you seem to claim is that a self-created, infinitely powerful, and omniscient being, is somehow a simpler, more economical, explanation than the universe arising from a scientifically defined “nothing”. (You will have to read up on Lawrence Krauss for the latest evidence that our universe looks just like a universe that arose from nothing would look like.) What you are saying is that an infinitely complex being is somehow a simple and economical explanation. Given the definition of God, any other explanation is more parsimonious. Yugo — Thanks for adding your comments. I appreciate it when people comment on my poor efforts to share thoughts that occur to me and interesting things that I run across. That’s an intriguing idea that maybe Dennett’s question isn’t a rhetorical question at all. Just a note about comments on this post. I’m unlikely to add anything else here or approve more comments. In part it’s that I’m working on other things, but also I’m disinclined to get involved in drawn-out arguments on these issues. That said, this blog is drawing a slowly-growing stream of comments, which emphasizes to me that I need to think out my policy about comments. As I’ve said before, I do appreciate others’ interest in my bumbling efforts to curate and comment on interesting things I run across.